Tea Time reminds me of moments with my Nanna. who looks down on me from heaven, with this card. (I try to grow them every year - sigh - to no avail.). 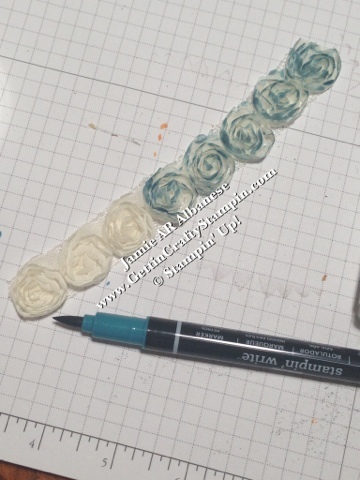 With the 5/8" Vanilla Flower trim (Spring Mini) is feminine and elegant, you can modify the color with the simple use of our Stampin' Write Markers, ReInkers, and Stamp Pads ++. 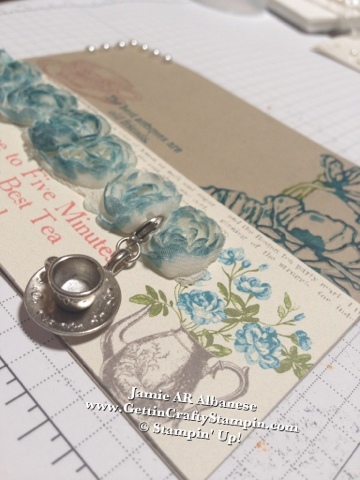 Tea Time Trinkets (Spring Mini) are soooo lovely! Add them to a card, project and you now you have a Gift Charm - a Gift on a Card! I don't know any lady who wouldn't love these timeless treasures for a necklace, bracelet, to attaching it to a ribbon for a window hanging. 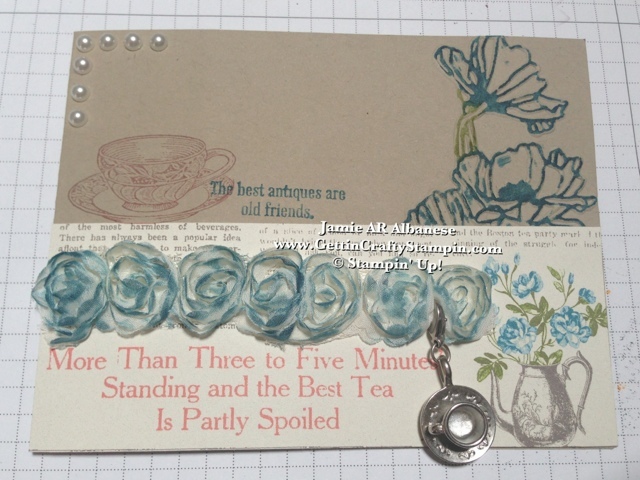 The Timeless Treasures stamp set is vintage and elegant. This tea cup and sentiment fit perfectly with this paper. The Flower Garden Folder almost looks exactly like the flowers in this Pitcher. I used the Lucky Limeade and Island Indigo Stampin' Write Markers to color the raised image and make sure that it's layered directly under the flowers in the pitcher on the picture. 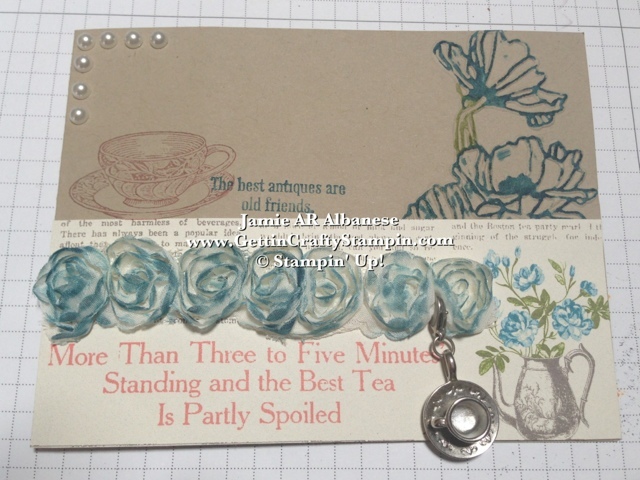 Tea for Two Designer Series Paper. 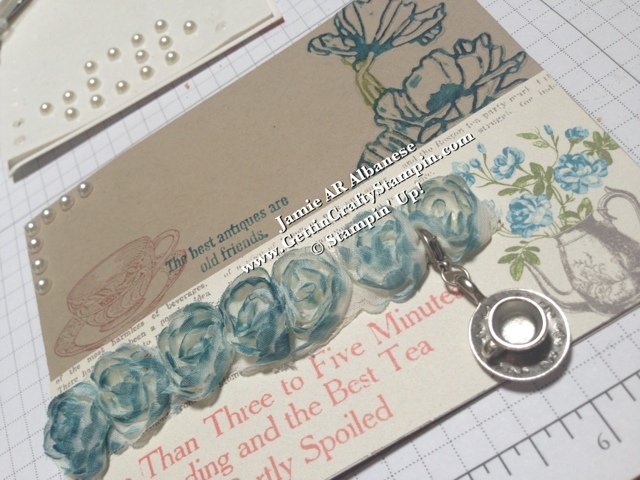 Add this Cup of Tea charm and it's just charming - lol. Pearls are a perfect way to add warmth and richness. Our Basic Jewels Pearls are adhesive backed and with over 150 pearls on a sheet (Idea Book & Catalog) for under $5?!?! Enjoy using them along with me! I love that this quick card can hold sooo many memories. 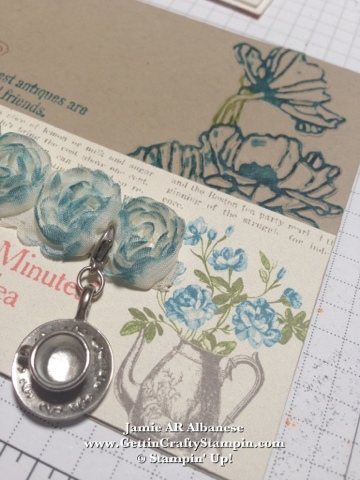 Don't Miss OUT on these limited time papers, inks, flower trim and tea trinkets. They are available for a limited time, so grab YOURS before they are gone! (Jamie Albanese) when you order on-line! 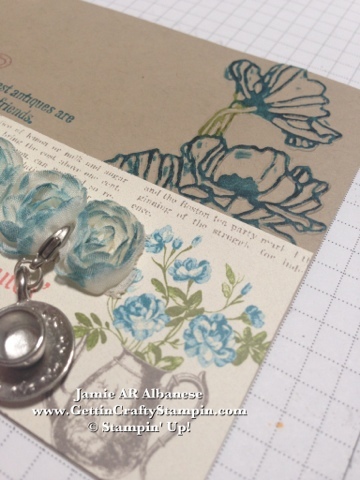 Labels: card making, Cards, Designer Series Paper, DSP, Paper Crafting, Spring Mini, Stampin Up, Stampin' Up, Stampin' Write Markers, Vintage, Vintage. I'm sure your nana is looking down at your card and is very proud of you. There are a lot of marvelous details in your card, and they all come together in a wonderful creation. Thanks for sharing your memories and the LNS group this week. What a beautiful card and I love the colored flower ribbon. Thanks for sharing this week with us at LNS! Very Pretty. Loved the colored flowers. Thank you for playing with the LNS Challenge.